Examples, solutions, videos, stories and songs to help Grade 3 students learn how to multiply using fact families and patterns. The following diagram shows some examples of the multiplication division fact families. 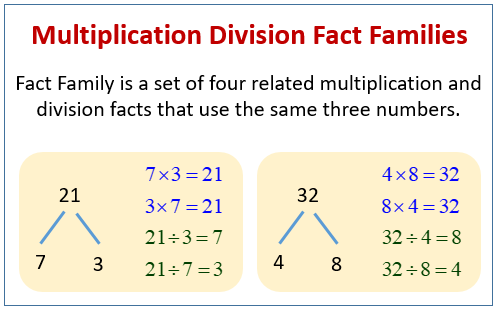 Scroll down the page for more examples and solutions using the multiplication division fact families. How to relate multiplication and division using fact families? The relationship between multiplication and division, and how students can use their understanding of multiplication to solve division problems.